Motherhood comes with endless pride, joy, and yes, societal judgements. 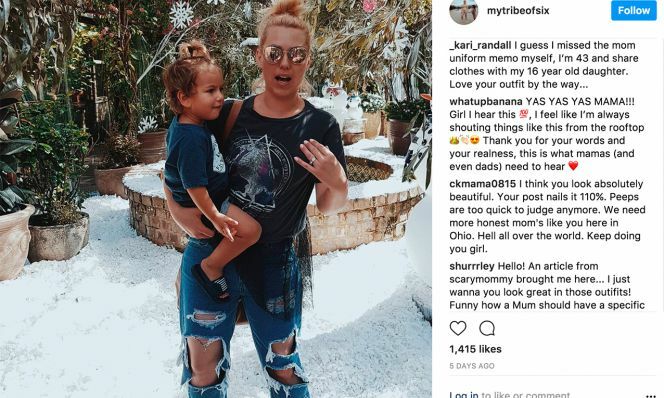 Stevie Niki, the blogger of the My Tribe Of Six site, received backlash from some followers for her modern style and was asked by one person to “dress more like a mom.” Stevie had the best reaction--ever. Stevie is referring to this look, which includes a t-shirt with sheer detail and ripped boyfriend jeans. The mom blogger often preaches self-love and body acceptance, including loving your bikini body after having kids. My Tribe of Six blogger Stevie Niki get support from her followers. Stevie is known for being very unfiltered about parenting and in this case, it’s much-needed. Moms are in the parenting trenches every single day. It’s hard work and the type of jeans you wear really have little significance compared to how you’re raising a child. People should model a behavior that’s more caring, accepting and understanding. Because isn’t that the example we should be setting for our own children?